This card is part of my April Class Kit featuring the Parisian Breeze Designer Series Paper and items from the Pretties Kit. It also features the designer label silver hodgepodge hardware, bashful blue taffeta ribbon and the Scallop Edge punch. As part of the Kit, all the paper is already pre-cut and pre-scored for you! All you have to do is stamp and assemble. Punched flower, silk flower, silver hodgepodge hardware, ribbon and pearl are all included in the Kit. This card has a lot of pieces but not hard to assemble. It's just a lot of little layers and has minimal stamping. You don't even have to have the stamping if you do not desire it. You can instead tie a knot with the ribbon or use Rub-ons instead. This card is the standard card size, horizontal layout, scored at the top. Adhere the Sahara Sand small piece of paper onto the floral pattern piece. 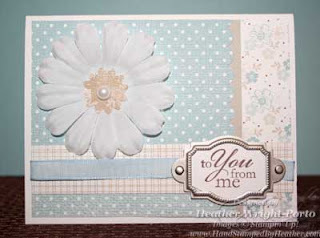 Then use the Scallop Edge punch on the blue/white polka dotted piece of cardstock and adhere all the 3 pieces together. Continue by wrapping a piece of Bashful Blue Taffeta Ribbon around the horizontal kraft/white pattern piece of paper. Stamp your greeting on scrap Whisper White. Line up under the label and trace or be prepared to trip/cut later -- or you can always purchase the Designer Label punch from Stampin' Up! Place the greeting where you want it over the ribbon/horizontal piece, then use the 1/16" Circle Handheld punch to punch a hole on either side of the label and adhere it using Silver brads. Now you are ready to adhere the horizontal piece to the polka dotted, previously assembled panel. Adhere all to the card front. Lastly adhere the small pearl to the punched out flower using a Mini Glue Dot. Adhere to the large silk flower, again with a Mini Glue Dot. Then adhere the large silk flower to the card front using a Pop Up Glue Dot.